As Buyer’s Agents, we have no properties for sale, but unlike selling agents, we have access to every property on the market including Melbourne, Brisbane and Sydney. As Buyer’s Agents, we are paid by you and receive no commissions from selling agents or vendors. We have no interest in any of the properties we recommend for purchase. In other words, all our recommendations are genuine and completely independent. Engaging Metropole means you won’t pay too much. Selecting the right property requires time consuming research of many factors including past sales results, market influences and factors that would impact on future values. Searching for the right property takes a considerable amount of time, – one of your most precious assets. Many of our clients are busy professionals and understand the need to leverage their time. We do all the leg work and present a shortlist of suitable properties for you to inspect. The team at Metropole has extensive property experience in the areas of property purchasing and negotiation. You can be assured that the people negotiating and securing properties on your behalf are well informed on market trends and values. 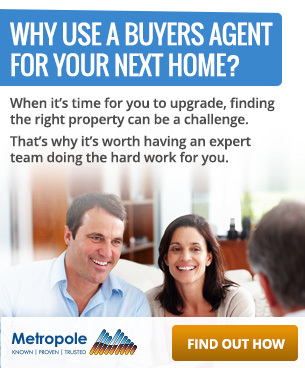 We have Buyer’s Agents in Melbourne, Brisbane and Sydney. We take the time to determine your needs and your long term goals at the beginning of the search process so that we can identify properties that meet all your requirements. The right property, at the right price, unbiased advice. We have Buyer’s Agents in the following cities: Brisbane Buyer’s Agent. Sydney Buyer’s Agent. Melbourne Buyer’s Agent. To arrange a FREE consultation, please call us on 1300 20 30 30 or simply fill in this form and we will be in touch with you.